Mother Earth has been experiencing benefits from 3D printing since the 70s. It’s not that there’s no waste or pollution produced with 3D printing, it’s just that the amounts are drastically lower than with conventional means of manufacturing. This is purposeful; reduced waste is an unspoken tenet of additive manufacturing and that’s one of the most alluring aspects of it all for myself. James Gardiner, Architect at the Australian Sustainable Oceans International, appreciates another characteristic of 3D printing however, and that’s the freedom to create intricate shapes that are similar to those of biologics. 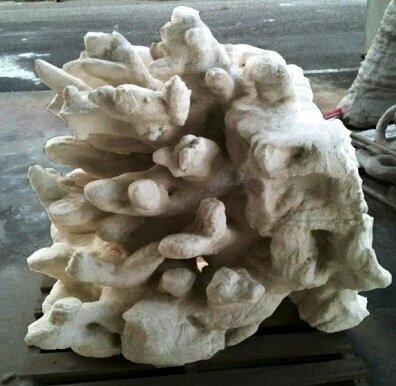 James worked on the method to use large 3D printers to produce unique, natural-looking coral reef. He does this, not because coral makes great home decor (though that’s true), but because of increased acidification and overfishing and several other unfortunate reasons, the real coral around Australia is dying faster than it’s growing. Half of the Great Barrier Reef has died and SOI has been trying to mitigate the damage by placing pre-cast concrete reefs to attract sea life. They’re pretty effective but even tourists can tell that they’re not real, so I highly doubt they’re really pulling one over on the fish. By printing the reefs instead though, it’s rather difficult to discern which are real and which are printed. Two of these 500kg sandstone reefs are being tested by Reef Arabia off the coast of Bahrain where there are already hundreds of concrete reefs. What’s really great about the new printed ones is they can easily be configured to look like region-specific coral to better trick the local aquatic entities. This is a large ecosystem and its collapse would have far reaching consequences throughout the global food chain, so its protection and restoration are vital to all life on Earth. I’m a fan of life, so I’m happy to see others making efforts to protect it. 3D printing is a valuable tool in the workbench of the environmentalist. No matter your opinion on the state of the planet and how it got there you should understand that waste and overproduction have negative economic and environmental impacts; recycling is nice but it’s not always efficient. It’s better to avoid overproduction in the first place. Save the whales by printing more of your stuff.